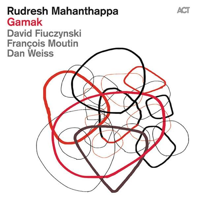 When I hear Rudresh Mahanthappa on this album, my first thought is Charlie Parker. I say this not because of speed, but because of integrity. The speed is there of course – solid, well-phrased and impressive, but it’s the individualized nature of Radresh’s compositional and improvisational styles that stand out. Most self-referenced, and in the generous, gregarious sense of the word. And the unique way the song forms are constructed gives you a lot to embrace. The whole band stands out this way: rapid, skilled, precise and creative--each player excelling and with strong flavor. All four can play extremely rapidly as individuals. Even more impressive are the myriad group unison runs that flow from start to finish on this album – the energy rushes through you like benevolent waves of lightning. Dan Weiss, as everyone should know by now, is a drummer’s drummer. On this album, his playing is super~aggressive and hotly complex, yet he is completely restrained in volume and leading from the back in a way I haven’t heard him do before. This feels amazing. He is so solid and so fluid and so in the pocket, at times it’s almost as if he’s playing the bass! His thoughtful tuning of the drums and the character of his choice of cymbals are warm and breathing models to be studied. And the rhythms – well, you guys try to figure it out. I had a blissful attempt anyway. As for the bass, we’re on funky, firm ground here. François Moutin’s adventurous spirit flings the band forward and in surprising ways. Many times, it feels like he’s functioning like a drummer that way. On “We’ll Make More,” Moutin embarks on a sparse, clean solo for a few bars that is so unexpected in placement and so rich in character, you’ll want to hit repeat, and several times; later on in the same tune, he repeats one note rapidly for several bars in time with the bass drum—uniquely rooting and propelling the group as they continue launch after launch in rapid unison. “ f ” is another stand out for Moutin. He opens the short tune and solos several times, dishing up multiple slices of dexterity and inventiveness. Last, but not least, David Fiuczynski on double-neck guitar. Mahanthappa wanted guitar on this album “because of the way that I’ve been thinking about melody and ornamentation and the fact that I wanted to delve into the use of alternate tunings.” (ACT Press Release, 2013). Everything Fiuczynski does is alternate; man, it’s vast territory he is exploring. With every hybrid link he adds, it’s as if he is extending a metaphor: we get the feeling of Hi-Life; we get a sitar sound that’s not; we get a soft yet blistering heavy metal guitar, various layers of rock guitar, a pleasing mosaic of sub-genre jazz guitar; the visual painting of a celeste, the flavor of a Rhodes, a punkish Hawaiian ukulele; an oud full of reverie – Fiuczynski just does not stop. And who would ever want him to? Even though this album is like nothing you’ve ever listened to, you don’t have to be an expert in cross-cultural study to gain access. Each seed~sound unlocks a spiritual portal that allows you to move further into and through the music, and since the beat cycles expand and contract, you get to move across several thresholds at once. Gamak will bring you many surprising and uplifting moments of joy and is a fine example of direct transmission. And that, I think, is their whole point. Live: at Le Poisson Rouge, New York on Thursday, April 11 at 7:30pm. Check out an interview with Terry Gross, NPR.